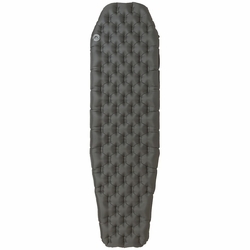 Big Agnes AXL Air Sleeping Pad. Simply put, this is the most comfortable and lightest ultralight warm weather pad you can put in your pack. Designed with gram counters, thru hikers, and technical gear junkies in mind, the AXL Air combines a high tenacity propriety nylon rip-stop shell with internal minimalist construction that maximizes every ounce's stability and comfort. With larger outer tubes this pad keeps you cradled on top, while the built-in advanced heat reflective technology helps to maintain an optimal temperature while you sleep. Save room and weight in your pack for other backcountry essentials, since you won't even know the AXL Air is in there. AXL Air and Insulated AXL Air Pad from Big Agnes on Vimeo.